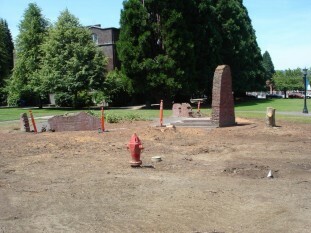 The Broken Wall Memorial located between Christie and Howard Halls is currently broken and under repair. The veterans’ memorial has been an evolving site. The first element is the Praying Hands segment, dedicated in 1948 as memorial and tribute for members of the UP family who served in World War II– the names of those who died in the war are engraved on the bricks, the total number of bricks is equal to the number of students and alumni who served. In 1948 the Praying Hands wall was the eastern most structure on campus – ten years before Kenna Hall and twenty before Shipstad. Landscaping was minimal. 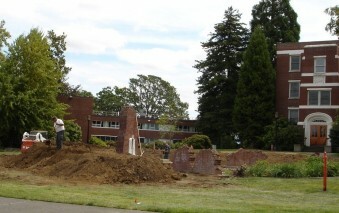 We just had not yet filled in the space between West Hall (now Waldschmidt) and Willamette Boulevard. 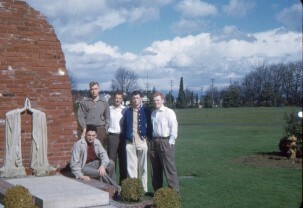 Into the 1960s the Praying Hands monument was incorporated along with recognition of our AFROTC program at the outdoor Military Mass, which itself was part of Campus Day events. The square border-hedge dates from 1962. No sheltering trees yet, but the fire-plug has been in-place since 1951. 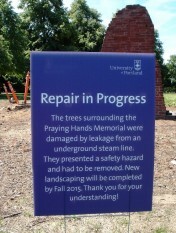 The familiar look comes from 1990, when Broken Wall segments were added to the Praying Hands around a circular pavement. More shrubbery was added. Also, from 1990, we have maintained the continuous tradition of UP cadets from Air Force ROTC and Army ROTC squadrons mounting 24-hour vigil for Veterans’ Day. November 11, 2015 will mark the Twenty-fifth year of this observance.